Is Tom's of Maine toothpaste really green if consumers leave the water running while they brush their teeth? Is an ENERGY STAR-rated light bulb really green if it remains on after everyone leaves the room? It is one thing to design a product to be greener, but the negative environmental impact made throughout a product's life-cycle cannot be minimized unless the consumer uses (and disposes of it) responsibly. "Responsible consumption"-- what I consider the next frontier of green marketing-is about conserving resources associated with using products. That includes encouraging consumers to use only what is needed and consciously reduce waste. As any life-cycle assessment will show, consumer usage can account for a significant portion of a product's total environmental impact, especially products such as laundry detergents, soaps, and shampoos that require resources, energy, and water to work. Manufacturers can design products to make it easier for consumers to minimize resource use, such as a duplex printing feature on a printer, or a dual-flush toilet. Real-time information, such as Toyota's dashboard and the new crop of energy meters and monitoring services, also help. But only consumers can push the "cold" button on the washing machine or turn off the water when they brush. Businesses have lots of incentives to encourage such behavior, and some already are pioneering innovative ways to enlist consumer support. That's because, when markets fail to address environmental ills, governments tend to intervene. Witness mandated shifts to energy-, fuel-, and water-efficient appliances, light bulbs, and cars. Will cold-water, laundry detergents, organic cotton, and leather-free shoes be next? Another issue that industry needs to be mindful of is "the rebound effect"-whereby consumers will buy or use more of a product if it costs less due to enhanced efficiency. A classic example of that is fuel-efficient cars that are driven more miles than less-efficient cars. Enlisting consumer support for responsible consumption is a surefire way to build credibility and reduce risk. Consumers intuitively understand that it is not possible to spend our way out of the environmental crisis. At the micro level, simply switching one supermarket-cartful of "brown" products with "green" ones will not cure environmental ills. Creating a sustainable society requires (among other things) that every one of us use only what we need and that we help recapture resources for successive use by recycling and composting. As I learned when advising HSBC on its award-winning "No Small Change" green marketing campaign, a key to the campaign's credibility was empowering people and businesses to reduce their carbon footprint, in line with the bank's own efforts. In other words, we weren't asking HSBC's customers to do anything the bank hadn't done itself. Sustainability leaders are now winning their stakeholders' respect by communicating the need to consume responsibly, especially in energy use. For starters, HP earned the No. 1 spot on Newsweek's list of the top green companies of 2009 by pledging to reduce product emissions and energy usage 40% from 2005 levels by 2011. Realizing that it needs to partner with consumers to reach that goal, the company has launched its Power to Change campaign, which encourages users to turn off their computers when they do not need them (e.g., at night) and tracks actions to calculate energy and carbon impact. Another example is Levi Strauss & Co., which teamed up with Goodwill to educate consumers on how to lower the life-cycle impacts of blue jeans. The company's "A Care Tag For The Planet" campaign uses online and in-store messaging, and a new care tag on jeans, to encourage owners to wash in cold water, line dry when possible, and donate their jeans (when they're no longer wanted) to Goodwill thrift stores. The company estimates that such steps by responsible consumers can reduce life-cycle climate-change impacts in half. Similarly, in Europe, Procter & Gamble's Ariel runs a Turn to 30 (degrees centigrade) campaign to encourage consumers to wash at lower temperatures. Spurred by the threat of regulation, the laundry detergent industry has united to promote responsible washing. And an industrywide Washright campaign launched in 1998 by the Brussels-based International Association for Soaps, Detergents and Maintenance Products (AISE) reached 70% of European households with tips on how to wash laundry in environmentally preferable ways. A final example is the Sacramento Municipal Utility District, which now knows that peer pressure is an excellent strategy for promoting responsible consumption-and may be even more motivating than saving money. In a test that began in April 2008, some 35,000 randomly selected customers were told via "happy" or "sad" faces (printed on their monthly utility bills) how their energy use compared with that of their neighbors and the most-efficient energy users in the district. Customers who received the information cut their electricity use 2%, compared with no change by counterparts who did not receive messages. The utility expanded the program to 50,000 households in August 2009. 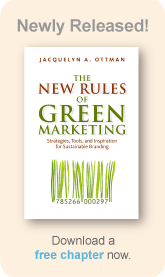 Jacquelyn Ottman is an expert adviser on green marketing to Fortune 500 companies and the U.S. government. The author of four books on the subject, her latest is the just released,The New Rules of Green Marketing: Strategies, Tools, and Inspiration for Sustainable Branding (Berrett-Koehler, February 2011), 252pp. $21.95. Her firm's website,http://www.greenmarketing.com, contains more information about the book.